C-ART -Eye Drops (Sodium Carboxy Methyl Cellulose & Glycerin Sterile Ophthalmic Solution) contain the active ingredient Carmellose Sodium, which is a type of medicine known as an eye lubricant. It is used for the treatment of the symptoms of dry eye (such as soreness, burning, irritation or dryness) caused by your eye not producing enough tears to keep the eye wet. Primary packing - 10 ml green colour Poly bottles green caps &Nozzles. 10 ml of solution in green colour poly bottles with green caps & nozzles in properly sealed. C-ART -Eye Drops (Sodium Carboxy Methyl Cellulose & Glycerin Sterile Ophthalmic Solution) has no pharmacological effect. Carboxymethylcellulose Sodium & Glycerin has a high viscosity, resulting in an increased retention time in the eyes. 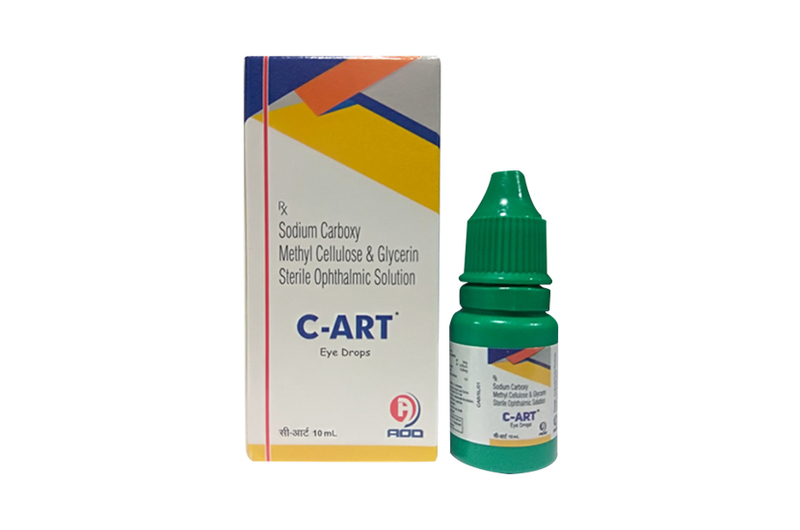 C-ART -Eye Drops (Sodium Carboxy Methyl Cellulose & Glycerin Sterile Ophthalmic Solution), is supplied in one green colour polethylene Bottle packed with printed labelled & cartons and Such 25 Carton Packed in a Shrink Sleeves & corrugated box.